My great-grandfather was known for two jokes. Two jokes! One of them he stole from Popeye…if you’ve watched Popeye then you already know where I’m going with this…So here’s one of his famous jokes—just for you and this joyous Thanksgiving occasion. Let me start by saying that I never had the chance to meet my great-grandpa. Upon investigation, I hear he was a loving man. Strong willed and sometimes very strongly opinionated…and a troublemaker. Which is funny, because he seemed like a very serious man. All of the photos that I saw of him showcased his piercing blue eyes and the most upright posture you have ever seen. Yet, this blog post already contains more context than his joke. It would simply come out of nowhere. My great-grandpa would be having a casual conversation, like people do, and then craftily slip in “I yam what I yam!” Then he’d half chuckle, half laugh to himself. It was contagious too. My whole family would start to laugh along with him. As I started preparing the below dish, the phrase “I yam what I yam” kept swirling around in my head. I wasn’t sure where I’d heard it. I clawed my memory for an inch more knowledge. It seemed to stem from a fleeting moment, located in the farthest reaches of my brain. Upon seeing my family for Thanksgiving, it instantly came to me. It was my great-grandpa (and Popeye, which is probably where he got it from too). I told my family about this recipe I created and now they demand that I make it for Thanksgiving. I thought I’d share it with the world, so your family can demand it from you too (you’re welcome). ORIGINAL RECIPE BELOW. You got it. This is another original recipe. Feel free to deviate as you see fit, as each family has its own traditions. Mine just really likes yams apparently. This apple-yam casserole with a spiced orange juice glaze is perfect for the festive Thanksgiving feast. Served warm, it can heat up any cold heart and fill up any empty stomach. The delicate baked apple paired with sweet and healthy yams not only matches the palette of the season (orange, yellow, and brown) but also satisfies the palate of the mouth. Difficulty: Way easier than preparing that turkey. Offer to make this instead. Wash your yams! Wash your yams and put them in a pot (keep the skin on). Add just enough water to the pot until the yams are covered. Increase heat to high and boil the yams for 25 minutes. *Note 1: Depending on the size of the yams, you may have to adjust the boiling time. Smaller yams=20 minutes. Larger=25 minutes. *Note 2: If you can stick a fork in the yams no problem, then they’re ready! If you encounter resistance, keep ’em boiling. Grapple with your apples. 10 minutes before the yams are done, wash the apples, and then chop them up into 1/4″ inch squares. Also, pre-heat the oven to 400 degrees Fahrenheit. *Note: I kept the skin on my apples because I like the texture when baked, however if you’re queasy about fruit to mouth sensations, then peel before chopping. Engage the glaze. 5 minutes before the yams are done, start mixing together the glaze ingredients. In a small bowl, combine the orange juice, lemon juice, vanilla extract, cinnamon, cloves, all spice, and honey. Mix until all chunks of spice are one with the rest of the mixture. Blaze your glaze. Using a small saucepan, heat the glaze mixture on medium heat for 4-5 minutes. Constantly stir the glaze so it doesn’t stick to the pan. The glaze should turn a dark brown color and start to thicken. Immediately remove from heat. *Note 1: If you notice dark/burnt chunks in the saucepan, it’s done! Remove from heat! *Note 2: Drain the water from the yam pot and let the yams cool while you cook the glaze. That way, you won’t have to play HOT POTATO for this next step. Hot potato, hot potato. Just kidding. You’ll still probably hurt your fingers a bit for this next step. Remove the yams from the pot and place them on a cutting board. Cut the yams length-wise and start to peel away the skin. Cut the yams into 1/4″ wide chunks as well (these can be whatever shape, it’s just good to have the same thickness as the apples). *Note: if the yams are still hot, let them be for a bit! Get the ball casse-rolling! Grab a casserole dish. Add half of the apples to one side of the dish and half of the yams to the other. Leaving one strip of butter for later, cut the butter into small chunks and place evenly on the apple and yam sections. Sprinkle 1 teaspoon of brown sugar. Then, add the other half of the apples on top of the yam section, and the other half of the yams on top of the yam section. Add the remaining chunks of butter and another 1 teaspoon of brown sugar. Sprinkle the salt and crack the pepper 2-3 times. Glazed over. Dribble (love that word) the glaze over the top layer of apples and yams. Cover and bake for 20-25 minutes. *Note: If you see liquid pooling at the bottom of the casserole dish, then the food is almost done. Once the liquid gets to about 1/2″, take it out! The apples should be soft enough to cut with a fork. See the 1/2″ liquid at the bottom? That means it’s done! Serve this dish warm! It will be really weird cold. It also re-heats really well, so keep that in mind if you’re running behind on time. This tip will help you for many dishes. Especially sticky ones. Put water in the pan that you used to cook the glaze. When you’re ready to do the dishes, it will be a piece of cake to clean. Robin Williams as Popeye the Sailor? I yam what I yam! Cute comic about a leftover Thanksgiving yam? Click heeere. 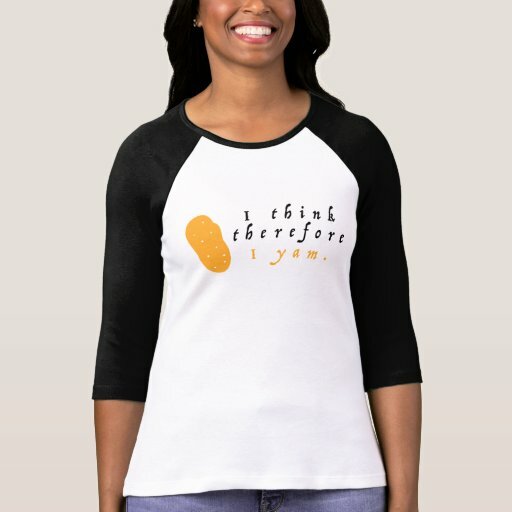 “I think therefore I yam” shirts. Yup, they’re real.